Deaf dogs: Montana at four-year-old, and Dakota, at 18 months, a new addition to the family. Both are congenitally deaf Australian Shepherds. Other pets: Quinn, a 4 year old Quarter Horse; Joey, a 17 year old Standardbred; 3 cats. Deaf dogs: Hamilton is 2 1/2 yrs old. He does a lot of rescue meet and greets on behalf of Mid Atlantic Great Dane Rescue League in the Philly area to promote rescue. He loves to ride in the car, take long naps and meet new friends. He is an AMBASSADOG for deaf dogs. He now has a sister, Eva, who is a deaf Dogo Argentino. She is 1 year old and learning from Hamilton on how to be a good little girl. She loves to dig, chase our cats and be a little terror, but she is doing better. We love them both. Human companions: Denise A Moran and her husband. Other pets: Lulu a Great Dane, spayed female, 5 yrs. Duce a Chow/Rotte mix, neutered male, 2 yr. Gerti a Beagle mix, spayed female, 6 yrs. Wesley a Carin Terrier, neutered male, 8 yrs. 5 cats, 2 rabbits, tropical fish tank, a pond of Koi and new member Madison, a 5 mo old brindle Dane little sister. 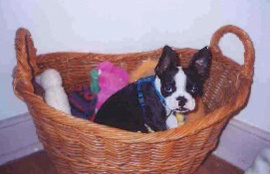 Deaf dog: Buster is a 5 month old Boston Terrier. He is a rescue from a mill. He's a spunky little devil who seems to have an unending source of energy. He loves his big sister Mandy. They play constantly and Buster has brought out the puppy in Mandy. Their favorite past-times are playing tug of war or chasing each other around the house. They give me hours of joy and are the hearts of my heart. Buster is not my first experience with deaf dogs. As a kid, my parents adopted a deaf dalmatian from our local shelter and she turned out to be one of the best dogs I've ever had the pleasure of knowing. My parents currently also have a deaf BT who was a rescue from a mill. Other pets: Mandy - 6 1/2 yr. old Border Collie mix and hearing. 3 cats all senior citizens: Squeaky (lost an eye due to Glaucoma about 8 years ago) - 11 yrs. ; Charlie Chaplin - 10; and Dusty - 10. 3 Cockatiels: Oscar, Trixie and Pretty Boy. 2 Parakeets: Lovey and Sunny. All my babies, with the exception of the Parakeets, are rescues in one way or another. 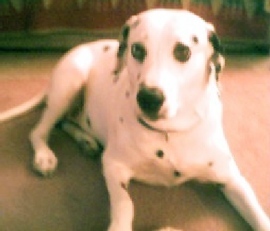 Deaf dogs: Sparky a Dalmatian. "We recently lost sparky, he was only 7 years old, he went quickly from an unknown cause of kidney failure. He is missed by all. Deaf dog: Wally is a wonderful White Great Dane. He is extremely smart, learns fast, and is very loving. He's a velcro dog (has to be stuck to you like velcro) and always draws a crowd when we go out in public for walks. An excellent "ambassador" for Great Danes and Deafies alike! He has a website that he shares with Stormy Weathers. Human companions: Diane, Todd my husband, Christopher our son, and Elizabeth our daughter. 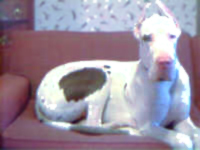 Other pets: Stormy Weathers, a Great Dane (8 months) and Bone-Bone, a Domestic Short Hair (10 years). Deaf dogs: Oliver, a 5 year old Dalmatian, is unilaterally deaf. At 90 lbs, he is big couch potato. Oliver becomes your instant best friend from the moment that you walk in the door. Benjamin, a four year old Dalmatian, is the youngest and bilaterally deaf. As the baby, Benjamin is spoiled. Benjamin learned almost everything he knows from his older brother, Oliver. Other pets: Pongo, a five year old Dalmatian; the cats, Shadow, Dickens, Kimba, Tigger, and Snaggle Puss. 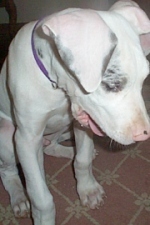 Deaf dog: Luther is a normal, active, 14 week old Great Dane puppy who was born deaf. His family knew he was deaf when he came to live with them. Deaf dog: Willow is a 10 month old Doberman Pinscher. Her family says "We adopted Willow, a fawn Dobe last week. We have another hearing Dobe and are excited to have another. She's very bright and already knows three signs. She definately is the dominent dog in this house. We're looking forward to beginning a training course and getting to know her better!" Deaf dog: Tessa is a 7 year old Dalmatian. "We bought Tessa at a pet store with guarantees against genetic defects. But, knowing if we exercised the guarantee she would probably be put to sleep we knew we had to keep her. We have never regretted that choice. Having a deaf dog has allowed us to connect with this animal on a level that few other pet owners experience. " 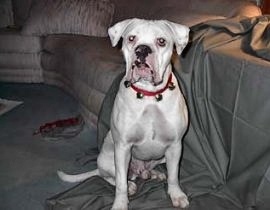 Deaf dog: Yogi is a 9 month old Boxer/Bulldog mix. "I adopted him from the DAL Rescue in Lewis, Delaware. I adopted him because I have an older Boxer and love the Breed." Other pets: Angel, a 9 year old female Boxer and two cats, Melba and GC. 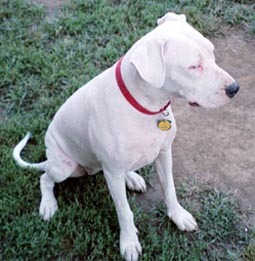 Deaf dog: Petey is a congenitally deaf Great Dane. "Petey is now 5 months old and has buried himself into our hearts. He has come such a long way and now knows about 10 signs. He has also started to attend Rescue outings for Mid Atlantic Great Dane Rescue, in the hopes that people will seriously consider giving a special needs Dane a home." Other pets: Leena, 8 yr.old hearing Dane; Daisy, 7 yr. old hearing Dane; and Black Jack, 5 yr. old special needs Dane. Deaf dog: Sadie is a 9 month old Retriever mix. "I adopted Sadie from a local SPCA. She was born deaf. She is an adorable, playful and eager to please little girl, and I am so happy she has come into my life. 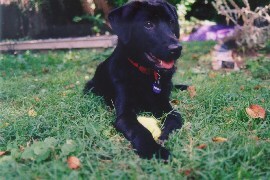 My nephews and I chose Sadie at the pound because she was so affectionate and playful, and yet quite calm for a puppy. We made an excellent choice, and I hope Sadie and I will have many happy years together. I think Sadie would make a great therapy dog when she gets older." 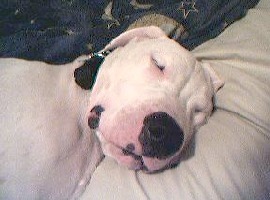 Deaf dog: Duke is a 4 month old Dogo Argentino. "I think he is great. He is learning very quickly. Duke is very friendly, definitely curious. When we first saw him something just felt right." Human companions: Doris Enciso, her husband and children. Deaf dog: We just got our dog and already she is a joy to have. She is more well behaved then the 2 hearing dogs we already had. There was an ad in the newspaper to find her a good home. My hubby always wanted a Great Dane and this was our chance, we didn't even care that she was deaf. I will update this as time goes by. I am still getting to know this beautiful dog, it has only been 30 hours! But she is great with our 2 kids ages 5 and 1 1/2. She is truly a gently giant. Other pets: Miranda- 6 yr old PitBull, Koda- 6 month old Shih-Tzu, 6 cats, 2 anoles, 1 hermit crab. 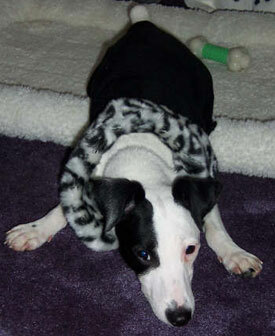 Deaf dog: Tiana is a rat terrier that is 7 months young. Deaf dog: Marley is a Jack Russell Terrier that is one. The first owner gave up Marley upon learning she was deaf. While searching for a home for Marley, the owner withheld mentioning her deafness and found a new owner. The second owner didn't know until much later, but it has nothing to do with her deafness, he realized it was not fair to Marley that he works many hours and doesn't have time for her as well as doesn't know how to deal with a deaf dog. Although he loves her dearly, he wanted a better home for her. That is how I came in the picture. She will remain with me until death do us apart! Since getting her, I taught her to sit and lay down. I also got a trainer from that'll guararantee me a lifetime. She is a lovable and sweet dog in spite of her rambunctious tendency. Don't blame her but on her breed! Deaf dog: Luke is our first deaf dog we have ever owned. 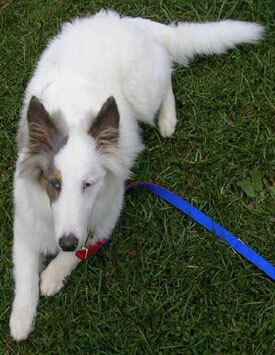 Luke is a purebred Shetland Sheepdog or "sheltie". He coloring is considered a double merle and he has two blue eyes. I picked him out not knowing he was deaf when he was a few weeks old. We found out he was deaf a few weeks before we got him. We originally wanted a sheltie for agility and I can't lie that I was somewhat disappointed. But him being deaf was just a bigger challenge and an opportunity to try something new. He must have been the puppy for us because we found out only after seeing his AKC papers that he was born on my birthday, May 29th. So therefore his show name is "Come What May", I think it is appropriate :) So far we have had Luke for around 6 Months and he has been a pleasure. He already knows sit, come, good, bad, treat, food, out, quiet, down, stay, give, and paw. He is also been doing some basic dog agility and we hope to compete very soon! Having a deaf dog is one of the most rewarding things I have ever done, I hope to adopt more in the future and hope that others start to adopt them too.